Bar manager Chris Grøtvedt pours me a Matrix. A pistachio green mixture in a stemless wine glass served with a big, circular, ice ball. He places it on top of a mountain of crushed ice in a spectacular container that resembles the sentinels – those metallic octopus-looking creatures in the second Matrix movie. Vapor is steaming out of the bowl, covering the bar like a mist falling onto the forest floor. I’m in the main bar on the ground floor of The Thief Hotel to get a more thorough introduction to The Movie List – a new cocktail menu with a very visual style and highly creative use of different glasses to serve in. The last time I was here, was a few months ago when I sat in the bar with Benjamin from Maaemo, and we drank almost the entire menu! I knew I had to come back to get the full story about this remarkable list of drinks. – I spent 12 months to find all the glasses for our menu, Chris tells me. – The Thief is a boutique hotel and we love art. A strong visual expression is important for us. You eat and drink with your eyes. Of course, our drinks need to taste great too, but we also wanted to create something fun that people would talk about. 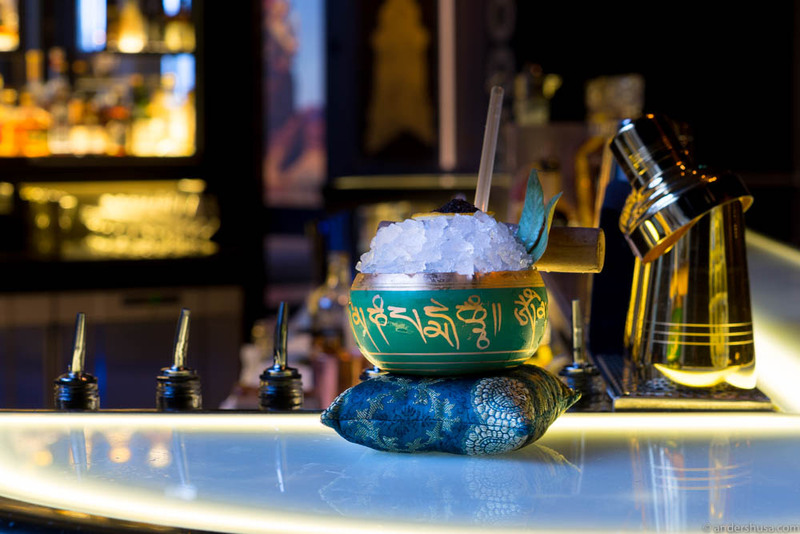 – My style has always been inspired by the likes of famous London bars The Artesian and Nightjar. In fact, I always used to stay at the Langham when I was in London, and Alex [Kratena] and Simone [Caporale] are good friends of mine. He continues to tell me about his own background story. How he started out as a professional ice hockey player in Fredrikstad, but his passion for mixing cocktails led him elsewhere. Grøtvedt’s first job in Oslo was as bar manager at Theatercafeen. – The movie theme was an obvious choice for us – we often have movie stars visiting our hotel, but also it’s something everyone can relate to. Most likely, you’ve watched one or several of the movies on our list. 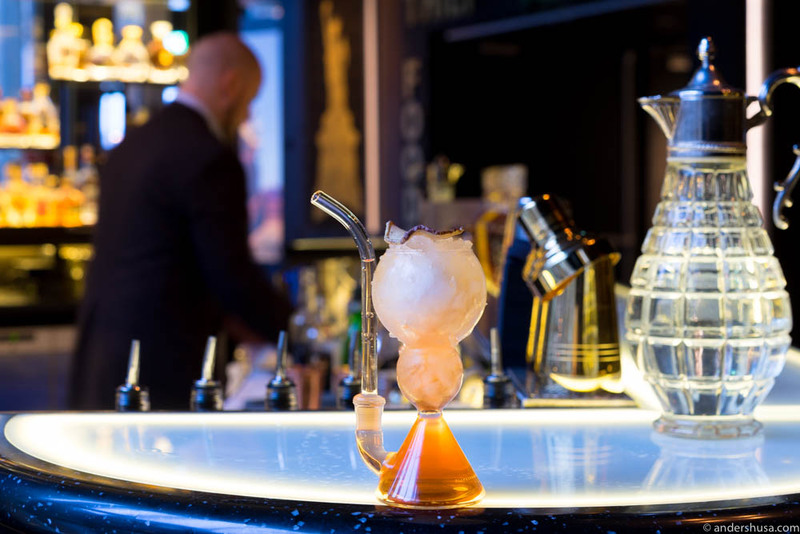 Ocean’s Twelve is a good example of how we use elements from the movie in our drinks. We serve it in a Fabergé egg, which is exactly what they try to steal in the movie. – For 7 Years in Tibet, we have a Tibetan music instrument: the singing bowl. For Clash of the Titans, we have the owl that is sent with Perseus on his trip to assist him. Dr. Jekyll & Mr. Hyde has a water pipe – often used for hallucinogens. Obviously, Big Fish is served in a, well, big fish … Vikings in a Viking horn, Buffalo Soldiers in a buffalo horn and so forth. Inception – Look closely, the glass is floating in mid-air. – If you’ve seen the movie you might remember that they use a token to distinguish dreams from reality. If you’re dreaming the token keeps on spinning – just like our drink will do, indefinitely. Although, if you want to find out exactly how that works out, you have to visit the Thief Bar. The Most Expensive Drink in Norway? Casablanca is the only drink on the menu that says Ask for price. – What is the price, Chris? – Well, it’s 5800 kroner. We sold the first one last week. 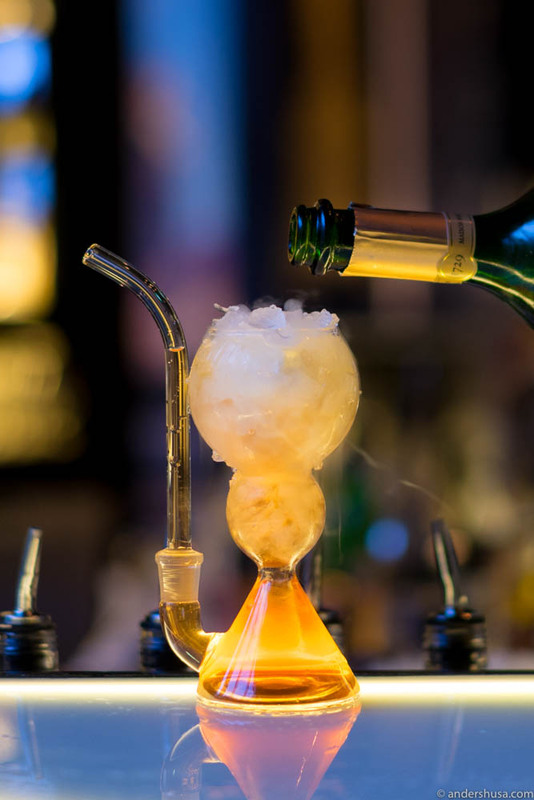 Although one guy almost ordered four of them once, but then we told him the price … It’s a mix of Hennessy Paradis Impérial and Dom Perignon Oenotheque 1996. It’s for those special occasions, Grøtvedt says with a smile. – It’s a classic Champagne cocktail, served in a Champagne glass, just like they drink it in Casablanca. – With our previous menu, the average guest might have enjoyed 5 or 6 out of our 18 drinks. Now, we’ve made drinks to suit the Norwegian palate. Everyone should like at least 8 or 9 from a total of 12 drinks now. There’s lots of refreshing options and quite a few with a nice sweetness. At the same time, we also like to challenge our customers a bit by using ingredients like smoked whiskey. Primarily, though, we are here for our guests and we want them to be able to explore our entire menu, instead of just ordering the usual like a rum and Coke. Last question, Chris: what are your favorite bars in Oslo? – We are good friends with the Himkok guys. They’re here a lot and we often have our final nightcap there after closing, since they’re open longer than us. In addition to that: I personally like Bettola a lot. 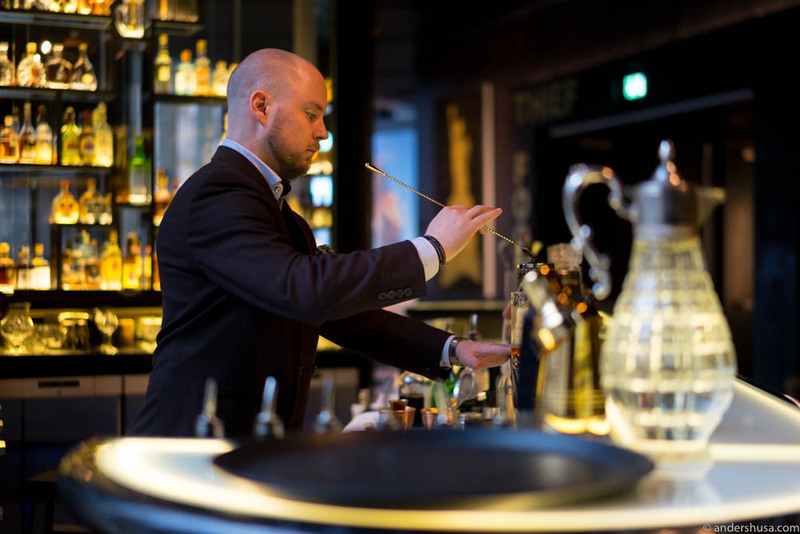 What’s your favorite bar in Oslo or elsewhere? Please share in a comment below.